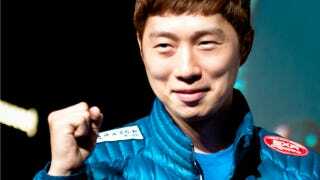 BoxeR (aka Lim Yo Hwan), the brilliant StarCraft player, recently retired from eSports. These days he's appearing on a South Korean reality show as well as cutting this teeth on a new career: poker pro. According to Donga Ilbo (via tipster Sang), Lim announced his new career decision three days ago. The eSports icon will be touring on the Asian Poker Tour and World Series of Poker. And during a recent appearance on reality show The Genius, Lim was introduced as a "Professional Poker Player." However, his co-star Hong Jin Ho (aka YellOw) is introduced as a "Former Professional Gamer." Lim said hold'em poker is "just like StarCraft" in that you must anticipate your opponent's moves. He added, "I will try my best to promote a healthy sport culture." The former eSports giant is also the spokesperson for online poker game Fulpot Poker. As Sang notes, Lim isn't the first StarCraft player to turn poker pro: Top-ranked player Bertrand Grospellier hung up his mouse and keyboard to become a world-class poker player.